How to Backup iPhone to Computer Fast & Securely? As an everyday device for everyone's use, it's a wise option for iPhone users to choose to backup iPhone to computer, thus keeping a copy of their important data like photos, music, SMS & voice memo on computer in case he lost them from iPhone (XS/9/8/7) after iOS 12 upgrade. Amongst all the method out there to backup iPhone to PC, which is the most reliable way to backup iPhone to computer with least chance of losing one's data for iOS 12 upgrade? Here we introduce top 4 ways to backup iPhone to computer for every user. ★ Restore to iPhone XS/XS Max/XR from backup. The close-end iOS system didn't allow its users to directly backup iPhone to computer in the past until iTunes was introduced, followed by iCloud backup solutions. However, iCloud backup wasn't as stable as expected even with years of practice obtained by Apple. That been said, a reliable & stable method is much-anticipated by many, especially when you need to backup and restore iPhone for iOS 12 upgrade. Which is the fast & easiest method to backup iPhone to computer, then? This page gives you the answer. With category-wide iPhone backup functionality that is both stable and fast, DearMob iPhone Manager is believed to be the best iPhone backup software 2019 that seamlessly work without iTunes to backup iPhone photos, music, videos, SMS, voice memo, calendars, notes & ebooks. Aside from all the backup categories, you may hassle-free remove DRM from iTunes movies, music with this product & enjoy them on computer to your heart's content. Step 1: Download DearMob iPhone Manager for Windows 10, install and launch it. Step 2: USB connect iPhone to computer, tap "trust" to make the two devices recognize each other. Step 3: When you see the iPhone name, click on "Backup" on the middle-right place. 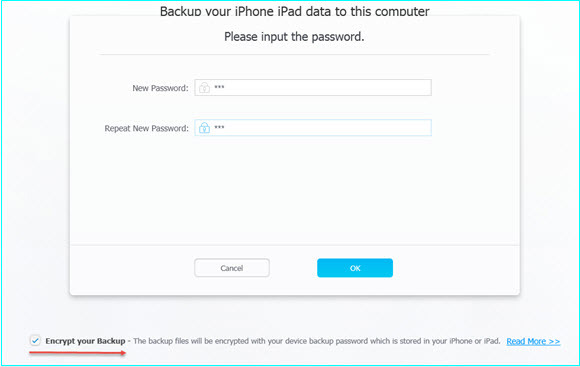 Step 4: Choose "Setting Password" to backup all iPhone data including Health & Homekit content which involves your personal security, or click on "Backup Now" to backup data without them. Tips and Notes: Note that you shouldn't plug out the iPhone/iPad when trying to backup iPhone to computer. Step 1: Update your iTunes for Windows to the latest version 12.7, as well as your iPhone to iOS 11/iOS 12, connect iPhone to computer. Step 2. With iTunes recognizing your device, click on the device icon. Step 3. Under "Summary", click on "Backup Now" on your right-hand menu. Though iCloud offers only 5GB of free space for you to backup iPhone to computer, it's indeed a nice option to backup iPhone data like SMS, contacts & notes. However, paying a little extra ( $0.99/month for 50GB, $ 2.99/month for 200GB and $9.99/month for 2TB) makes you better able to backup iPhone to computer. Ain't you upgrade, yet still looking for more storage? Please look back on DearMob iPhone Manager for unlimited gigabytes of iPhone backup to PC. However, if you're fine with iCloud, here's how you can backup iPhone to computer with iCloud. Step 1. Install iCloud client for your computer, log in with your ID & password. Step 2. Visit Settings on iPhone > iCloud > Backup Now, then wait until the process completes. Step 3. Launch the iCloud client on computer. * If you only need the photos backed up from iPhone to iCloud, click on the small iCloud icon in the downside-left menu tray of Windows > Right click on it > Download Photos. * If you need to backup iPhone to computer and download everything that you've uploaded to iCloud, visit icloud.com. 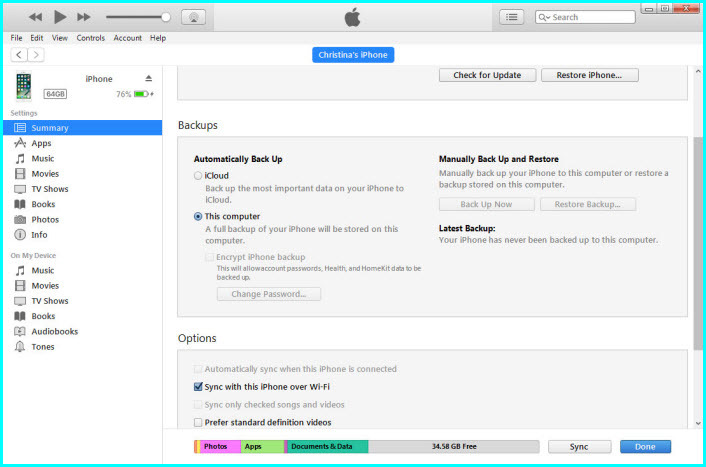 Tips and Notes: Should you have any problem when using iCloud to backup iPhone data, check out this collection to solve iCloud backup could not be completed. 80% of iTunes users never came to know that they could backup iPhone to computer over WiFi using iTunes, but in fact it does, though still with some of the errors you could meet like iTunes not recognizing iPhone [solved]. Here's how you can backup iPhone to computer with iTunes over Wi-Fi. Step 1. Upgrade iTunes to the latest version, click to launch it. Then USB connect iPhone to iTunes with your original USB cable. Step 2. Click on your device icon on iTunes, and then choose "Sync with this iPhone over Wi-Fi", then click "Apply". Step 3. Disconnect your iPhone from computer, and choose the category of iPhone data that you want to sync from iTunes to iPhone. When your iPhone and computer are connected to the same Wi-Fi, you can wirelessly backup iPhone to computer using iTunes. Against Apple's native tools to help you backup iPhone to PC (Windows 10), DearMob iPhone Manager is a product designed with usability and stability, hence recommended. 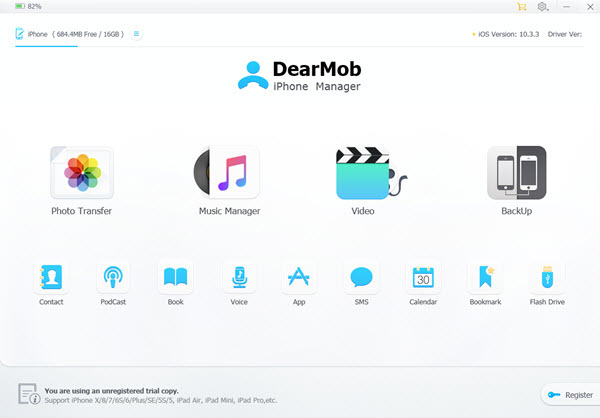 DearMob's iPhone Manager is a smart solution offered to not only backup iPhone data, but also add ringtone to iPhone, or help transfer songs from computer to iPhone as long as you USB-connect the two devices. Now click to download it below!